Another new business breaks the rules, get’s fined. Alistar Green Legal Services Ltd was registered with Companies House in October 2016. By March 2017 both the ICO and TPS were receiving complaints from consumers about calls they had received. 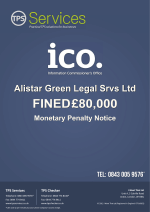 Alistar Green Legal does not appear to operate a website which seems to be more common sight with companies receiving fines lately. It’s as if they would rather not be found? During a four month period between 13th March 2017 and 18th July 2017 a total of 213 complaints were received from people registered on the TPS. The company blamed the complaints on new dialler manager who, they claim, did not inform them of any issues for fear of losing his job. The ICO criticised the company for failing to have agreements in place with their suppliers, which is not a legal requirement. The ICO are doing this so much so that you’d think they’d make it law or else stop making an issue of it! “It’s incredibly difficult to know whether or not the company tried very hard at all to screen their data against the TPS. If your business purchases or sells data then you should read the latest Direct Marketing Guidance issued by the ICO for a complete explanation of what the ICO expects from companies involved in or buying from the direct marketing industry.